As we left New York to head to New England, the road trip portion of our trip was ready to get serious. We rented a car in mid-town Manhattan, and hunkered down for a six-hour drive. 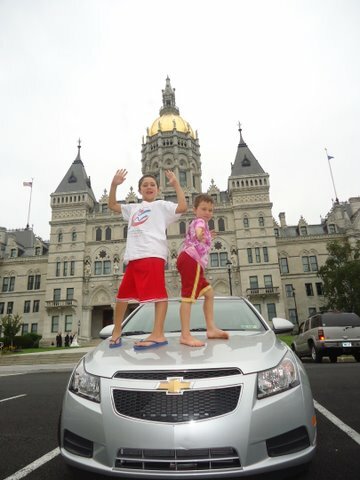 We played the license plate game to help pass the time, stopping in Connecticut just long enough to grab a photo of the Capitol in Hartford. The time passed quickly as we made our way across Massachusetts shouting our license plate finds — “Massachusetts! Maine! Arkansas? !” A few minute into “Live Free or Die,” first-primary-in-the-nation New Hampshire, we were grateful that Hertz had rented us an American-made car. Ever since we decided to come to New Hampshire, I’ve been eager to see what all the fuss is about. I was on the lookout for Republican candidates and wild blueberries. I wanted the real New Hampshire. We pulled into historic Portsmouth, a place Christopher remembered as a small fishing and port town from his last visit twenty years ago, and discovered instead a humming nightlife filled with upscale restaurants and summer revelers. In Prescott Park on the waterfront, a summer music festival was underway, with an al fresco performance of The Wizard of Oz heading that night’s bill. For dinner we had ice cream cones from Clark’s Creamery — vacation dining at its finest; it just seemed right at the time. At Clark’s they serve up Shain’s of Maine ice cream, and a “small” cone is two-scoops high, for $1.5o. We liked New Hampshire right away. Fortified by ice cream, we finished the last hour of our drive to New Durham, New Hampshire. We arrived at our rented house on Merrymeeting Lake well past dark. “I can’t wait to wake up and see the lake,” I said to Christopher as I closed my eyes, ready for the vacation part of our vacation to begin. In the morning, before I opened my eyes, my ears alerted me to the rain. But the clouds soon lifted, and we were welcomed by a glistening and quiet lake. Our house came with a kayak and a canoe, and we were all eager to try them out. “Can I go in the kayak alone?” seven-year-old Emmett asked. Hmmm. There is a sensation that happens when you watch your child exert a new independence. It is a giddy thrill, accompanied by nervous laughter. The first time I experienced this phenomenon, Aaron was 18 months old, on a kiddie ride alone for the first time at the Santa Monica Pier. He sat in the bright yellow car, doing circles on a track, smiling at me and waving. Watching across the gap between us, he looked so big, like he’d stepped up a notch on the developmental charts. I waved and laughed like a fool. Back to the kayak. 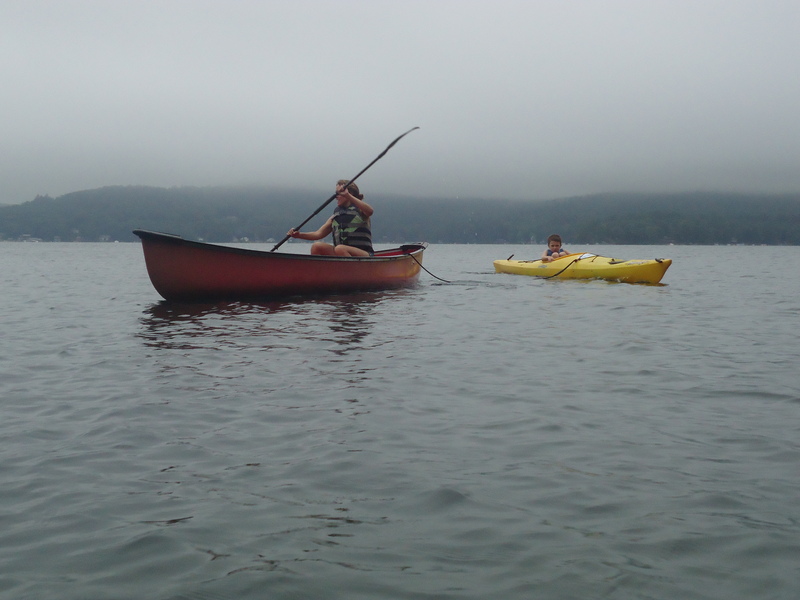 Christopher answered Emmett in the affirmative, and then followed him in the canoe. Seeing my younger child alone in that narrow yellow vessel on a wide blue lake, preposterously green trees all around, my reaction was to laugh in shock and delight. He can do more than I expect. Lake life has agreed with our boys. 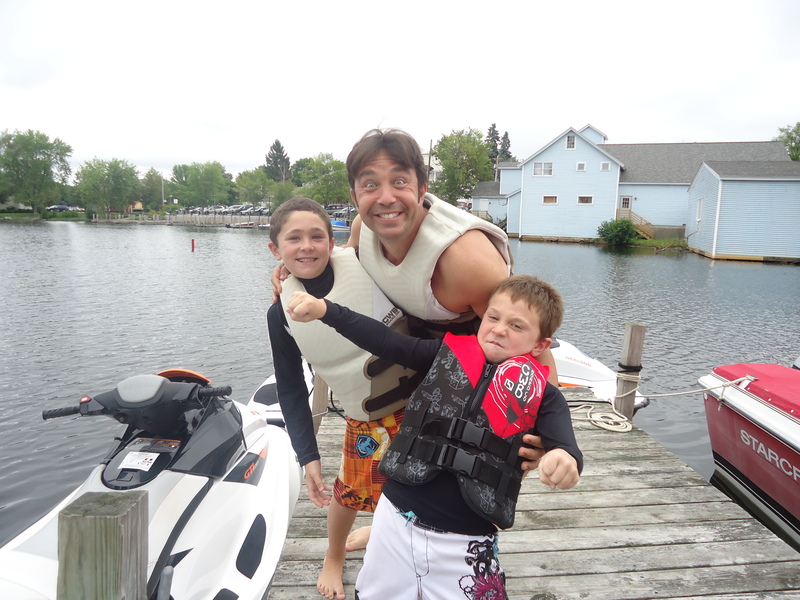 Not only do Emmett and Aaron both love to spend time in the kayak, swimming, and perfecting their cannonballs from our dock, but they are now in love with jet skiing. 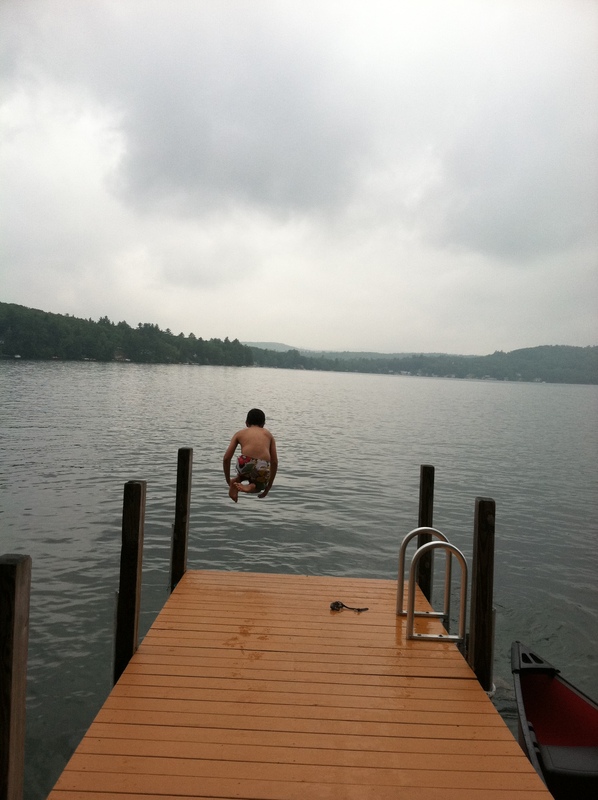 We headed up to Wolfeboro, “the oldest resort town” in America, which is situated on Lake Winnipesaukee, to try it out. 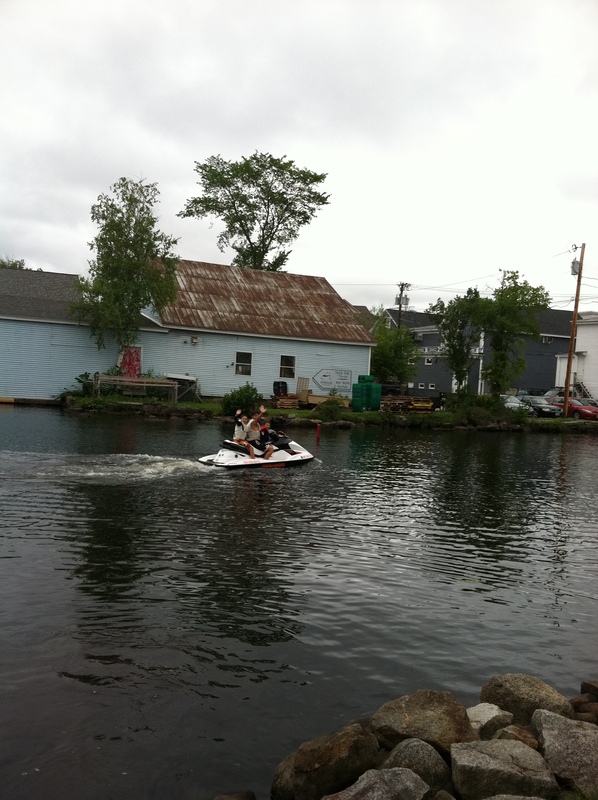 I’m now pretty sure my children think New Hampshire’s “Live Free or Die” motto has something to do with speeding on a lake, wind bursting through your hair, and shrieking at the top of your lungs. And who’s to say they’re wrong? Before leaving Wolfeboro, I bought a blueberry pie from the Yum Yum Shop across the street from the book store. Now if I can just find Mitt Romney, we’ll have covered everything.